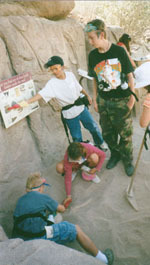 Ellis A. Gimbel Trust sponsored the Art and Science Camp Program for 2002-03 season. 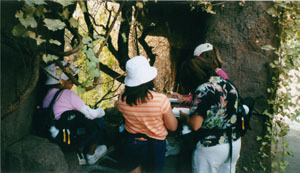 One hundred Tucson Children benefited from a rich natural history experience at the Desert Museum. Students take natural history walks, join sketch sessions on the grounds, and learn digital photography to deepen the experience. In the afternoons, Art Instructor Mary Ann Wilson lead the group in fine art instruction using their field notebooks and photography. Each child receives natural history equipment and art supplies to continue exploring and observing the environment long after the camp ends. Children are enrolled in an 18 month membership with the Desert Museum's Coati Club. Mary Ann is past Administrator of the Joseph Gross Gallery at the University of Arizona, and an Art Educator with extensive experience teaching children art in different settings. She served on the Public Art and Community Design Committee for the Tucson/Pima Arts Council. Mary Ann is a skilled teacher of youth and devotes much of her time to youth organizations in various capacities. Susan is a new Docent at the Desert Museum, having completed a career in nursing and wellness. Connie has devoted over twenty years of interpretation to the Museum as a Docent. She is a retired elementary school teacher with a love of the arts and literature. 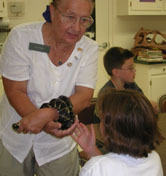 Connie is currently a student in the Desert Museum's Natural History Art Institute. Gay Miller is an experienced Docent who has earned the service award for over 10,000 hours of interpretation at the Desert Museum! She is a potterer and artist, with experience teaching children art and natural history. Jamie Carson is a Master's Level Environmental Learning Intern in the University of Arizona's College of Education Teacher Certification Program. She spent one year at the Desert Museum learning teaching techniques from Education Staff and participating in evaluation of our program outreach to school children. She will embark on a Ph.D. in the Fall.